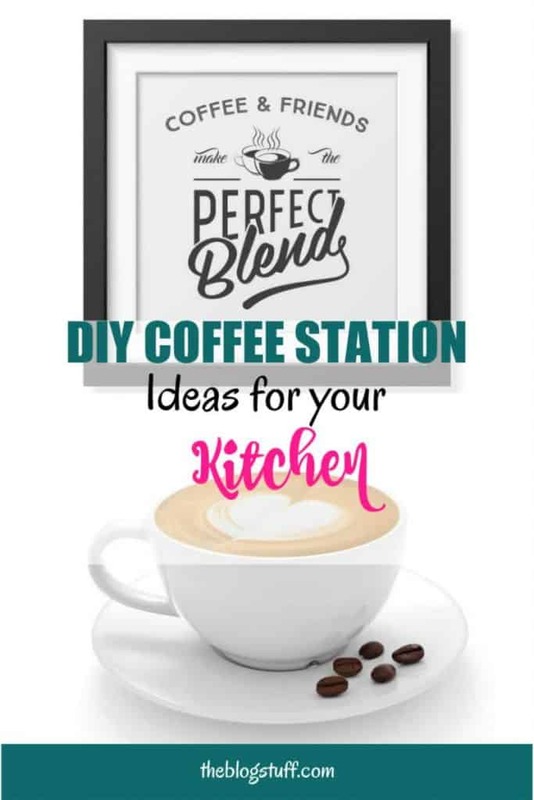 That’s why I’m researching and sharing great kitchen coffee bar ideas and decor tips you can use to create your own DIY home coffee station at home. It’s time for a caffeinated DIY project where you can turn part of your kitchen into an awesome coffee bar. I hope you find inspiration in these kitchen coffee bar ideas and decor tips. I love them all! If you are a coffee lover and agree with me that humanity runs on coffee, then this one is for you. 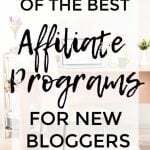 Below you are going to find ideas and decor tips to create a coffee house theme in your kitchen, and have an inexpensive coffee bar at your convenience. But first things first.The success of any DIY project begins with a good plan. So, this is how your mini coffee house or call it kitchen coffee bar, will come along. First, take some time to study the layout of your kitchen. It doesn’t matter how much space you have, if you are determined to have a coffee bar, even a table and some chairs will do. However, for now, let’s see what you can do with some extra space that I hope is already available. Check and make sure that you have enough storage space for all the supplies needed. Make proper use of available cabinet space. If you have the space you could build more shelves. More room can be created by installing wall hooks for mugs and cups. 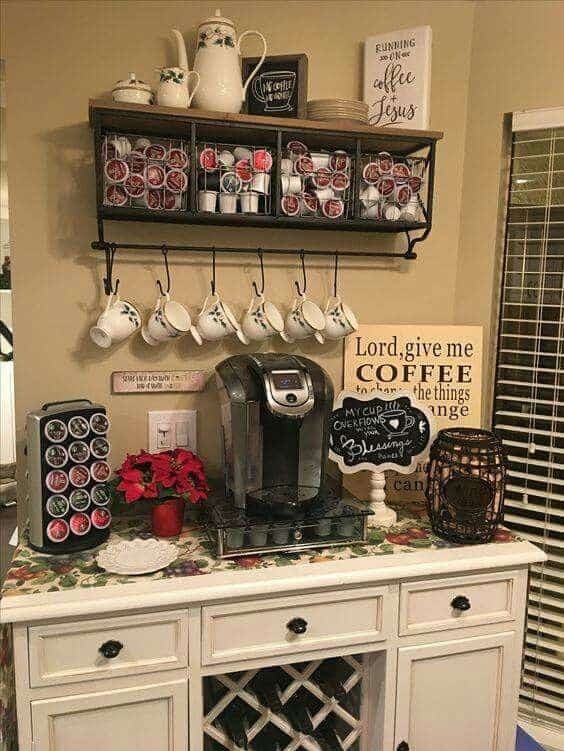 ✅ This coffee rack for the wall is a great idea when you are short of space. It screams coffee bar with a rustic touch. As you scan around the kitchen, remove items that don’t really belong there and put everything back in its place. Free up some cabinets as you will need the space. Having taken a look at your kitchen, the available space and with the supplies enlisted, it is easier to locate a good position for the station. The best positions are usually just next to the window but within reach of kitchen cabinets. If you want an easy project, consider a basic modern coffee house. Is uncomplicated because you will keep as much of your original kitchen design as possible. This means you might just have to make use of the existing cabinets, countertop, and utensils. The style for this coffee station is simple. The countertop should be the number one choice for the station’s location. A less extravagant option is using a corner of the kitchen that is not much frequented. # Pick a coffee organizer you can place on your countertop. This one below will keep all your coffee items perfectly organized. If you are not a fan of plastic cups you could substitute them with ceramic mugs. It looks more homely and stylish. # Use the beautiful rustic tabletop below to add some coffee cups, mugs or anything you think it will go with a coffee bar in your kitchen. # If you don’t have enough countertop space you could use a kitchen trolley where you can place all your coffee bar supplies. The one below has locking wheels and is perfect for small spaces like corners. 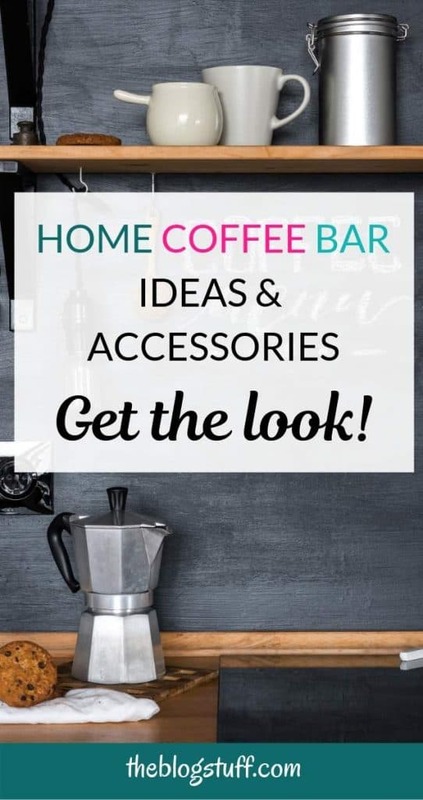 Home coffee bars look more appealing when they have a theme. A modern coffee house cafe-style theme with a touch of vintage spruce will look great. You can decide to go retro-vintage, elegant-modern or just a simple rustic-country style. Mix styles to suit your taste. For instance for a modern theme with a touch of retro-vintage you could go for a bistro seating style, with the chairs painted in cream, brown or tan shades. Next, shop around for coffee-themed mats, wall art, and vintage serve ware. A vintage grinder will also do wonders. # You could also display some cakes or cupcakes on a decorative cake stand, and cookies in clear glass jars similar to the one below. # A personalized ceramic cookie jar will make your coffee bar stand out. # Make some difference on the wall by painting a portion of the nearby wall with chalkboard paint and have some fun writing daily coffee quotes below the menu of the day’s special treat. Or get a similar effect with the rustic chalkboard sign below. This step involves making a list of all the things you will need to bring to the coffee station. In many cases you will find out that you have almost everything you need. But if you don’t check the choices below. How would you like you coffee in the morning? Coffee makers take center stage on your kitchen bar and should be allocated a special place on your countertop. ✅ Take your pick from these coffee machines: espresso, French press or filter. 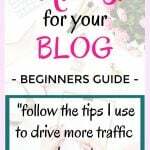 # If you need to update your coffee mugs, cups and saucers have a look at the ideas below. At the moment I’m into clear cups for my coffee but I’m considering the porcelain mugs to add some color into the mix. Allow your creativity to take the lead here. Remember that some things like milk and cream have to go in the refrigerator. It is YOUR coffee bar, so play around with the presentation and come up with something great. 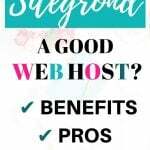 You can incorporate other kitchen coffee bar ideas such as a wooden tray for condiments, a spice rack for various powders and spices, and a vase of mild but fresh flowers. You can also choose to display your assortment of coffee beans in airtight glass jars. ✅ What about these stylish canisters to keep your ground coffee or coffee beans really fresh? 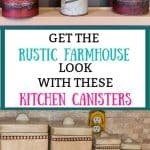 ✅ Need canisters for your kitchen? Have a look at these selection of country kitchen canister sets. The DIY kitchen coffee station is done, and it’s finally time to make your first cup of coffee in your very own home coffee bar. Whichever type you want to make will now taste even better. Time to invite your friends over and boast about your latest achievement. Do you have your own home coffee bar? What’s your style? Share your thoughts in the comments section below.